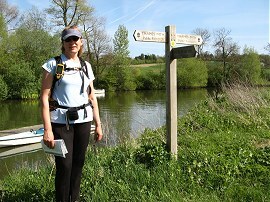 I did this walk with Sara on 10th April 2011, the day after our 18 mile walk from Radcot Bridge to Swinford Bridge. The day started slightly cooler than the previous day but its was still bright and sunny and the weather soon warmed up. After getting a little sunburnt yesterday I had plenty of sun cream on today but was still feeling quite hot by the end of the walk. 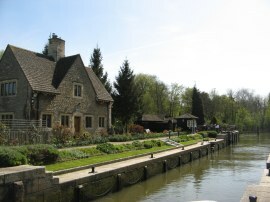 From Witney we drove over to Lower Radley where we were able to park on the roadside not too far from a footpath that leads down to the Thames before heading over to Swinford bridge where we once again parked in the little car park associated with the toll bridge. Rejoining the riverside path at Swinford Bridge, photo 1, it was only a few yards down stream before we reached Eynsham Lock, photo 2. 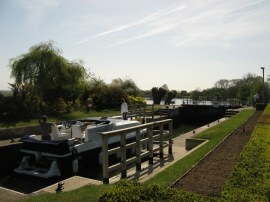 A couple of boats were getting ready to use the lock and we would see them at several other places along the river throughout the day. 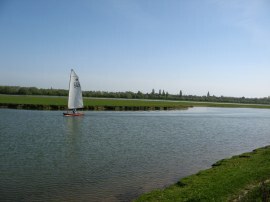 Shortly after Eynsham Lock the slopes of Wytham Hill reach down to the waters edge and for a while the path heads along a narrow tree lined track with the hill arising away to the right besides the path. 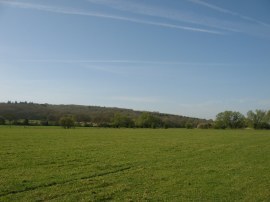 This stretch of path does not last for long though and the path soon enters another large grassy meadow, photo 3, the edge of the hill gradually bending away from the river around to the right. Photo 4 was taken looking back towards the wooded slopes of Wytham Hill, although this looks rather flattened and less impressive in the photo than in reality. 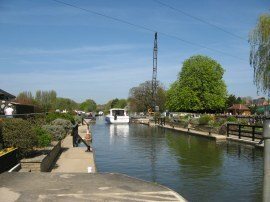 We passed by the junction where the River Evenlode joins the Thames, where there were a few canal boats moored besides the river bank, photo 5, and continued on along what was another very pleasant section of path, photo 6. 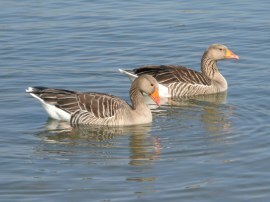 There were a few ducks about on the river but the two most common species that we saw on this part of the walk were groups of swans and also Greylag geese, photo 7. We made good progress as we headed downstream along the river and just over an hour after setting off had reached Kings Lock, photo 8, which if I have been countig right is the tenth lock we had passed. 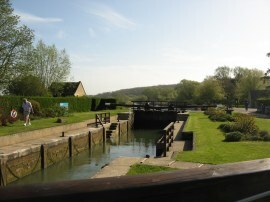 Along with Eynsham Lock this was one of the last locks constructed on the river having only been built in 1928, and heading in a downstream direction, is the last of the manaully operated locks on the river. Up until Kings Lock the Thames had been heading in a more or less easterly direction but at this point turns and begins heading in a much more southerly direction. 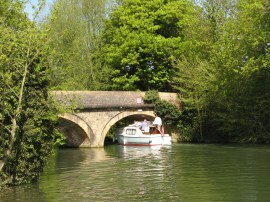 From Kings Lock it is only just over a further mile or so downstream to Godstow Lock. 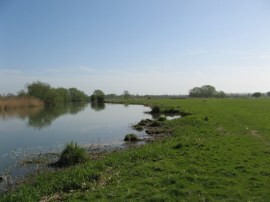 At first the river heads over the grassy meadow besides the river, photo 10, before passing under the A34 dual carriageway and joining a more enclosed stretch of path besides the river which leads up to Godstow. 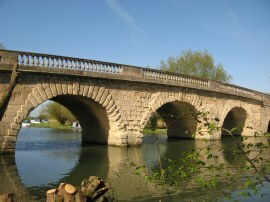 Reaching another small stone bridge, photo 11, the path crosses the road and head into the grounds of Godstow Abbey, photo 12 which was founded in 1139. 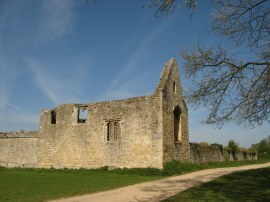 After the dissolution the abbey became a house however this fell into disrepair after being badly damaged in the civil war. 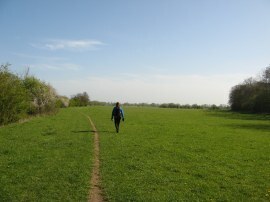 After many miles of remote and isolated walking we were now approaching the outskirts of Oxford and suddenly were sharing the path with many other people out enjoying the sunshine. 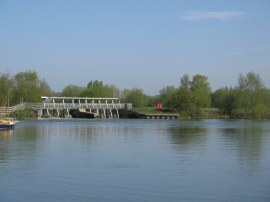 A short distance below the abbey is Godstow Lock, photo 13 where one of the two boats we had seen at the start of the day was just passing through. 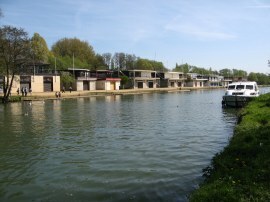 Below the lock gates we got our first glimpse of Oxford, the city situated on the far side of Port Meadow, photo 14. 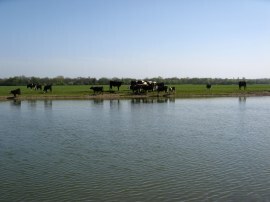 Port Meadow is an ancient area of grazing land, still used for horses and cattle, and has never been ploughed. 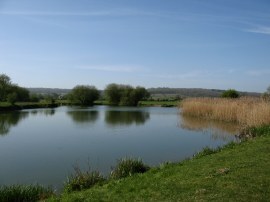 In the winter the meadow floods and there was still a fairly large pool of water visible in the grassland towards the southern end of the meadow which from a distance I had initially though was another meander of the river. The Thames path follows a broad grass track running on the opposite bank the meadow which was being grazed by horses and cattle, photo 15. A little further on we even saw a small sailing boat heading up the river, photo 16, as well as passing a couple of people who had been in swimming. This was a far more attractive entrance to Oxford than I had been expecting and a place I could have easily stopped for a long sit in the sun to watch the world go by. 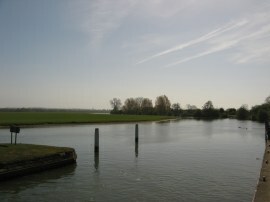 However we headed on down the path and soon reached the Medley Footbridge, photo 17, where the path crosses over to Fiddlers Island. 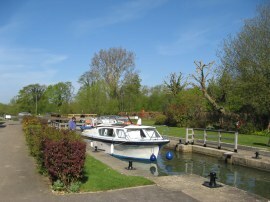 The route then follows a footpath that heads past a small marina, photo 18, and along a narrow tree lined riverside path where we stopped for a short snack break on a convenient bench. 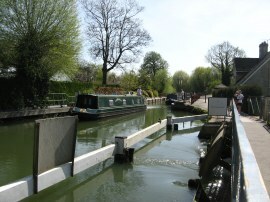 This section is followed down to cross over the arched bridge to the right of photo 19 which marks the entrance of a short stretch of water known as the Sheepwash Channel linking the River Thames to the nearby Oxford canal. The path then runs along the back of some houses, with allotments on the opposite bank, to reach the A420 Botley Road in Osney. 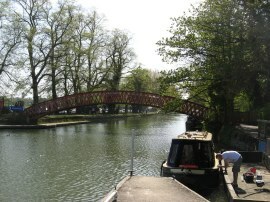 The route uses the road bridge to cross over to the other bank from where it is just a another short walk past houses and an old wharehouse building, photo 20, to reach Osney Lock, photo 21, where the path crosses a metal footbridge over the weir before heading past the lock itself. Below the lock the path heads by an industrial estate along a tree lined stretch of path where the path passes under some railway lines, photo 22, the first ones that I can recall crossing the Thames since the start of the path although doubtless we will pass under many more as we continue our walk downstream. 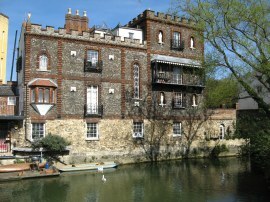 The path then heads by more houses, the river bending round to reach a small island by Folly Bridge where the house in photo 23 was located. 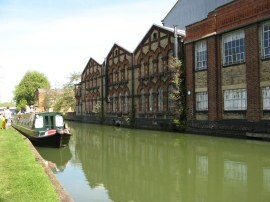 The route heads across the road and rejoins the river bank, where on the far bank was a very busy pub, before continuing on by the Oxford University College boat houses, photo 24. The urban environment had been in sharp contrast to the meadows we had been walking along earlier in the walk however we were now starting to head away from Oxford and out into less developed countryside once again. 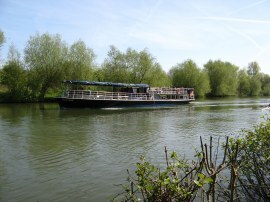 Just below the boat houses the river Cherwell joins the Thames, adding yet more water to the ever growing river which now contained some quite large pleasure boats, photo 25, this was one was the Wargrave. This section of path was also busy with cyclists hurrying by, which we both found a bit disconcerting as they did tend to fly up very quickly and quietly. 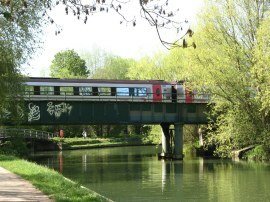 With us both often stopping and stepping either backwards or forwards on the path to take photographs it was a recipe for an accident and was the same problem I had faced when walking up the Paddinton Arm of the Grand Union Canal a couple of months earlier. Reaching a slight bend in the river we passed a small boat house and then crossed two small bridges over the entrance to the Weirs Mill Stream before heading under the B4495 road bridge. 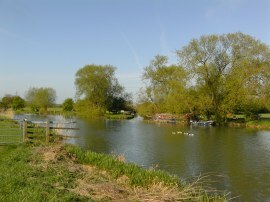 The river is now running alongside Iffley Meadows which are a series of alluvial flood meadows which are still managed traditionally as hay meadow and permanent pasture. The path passes the Isis Tavern which was packed with customers, and seemed to be the destination for a large number of the cyclists, before heading on Iffley Lock, photo 26. 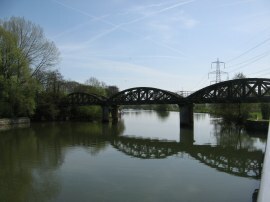 Below the lcok the numbers of people on the path started to drop as we continued dwnstream passing under the A423 road bridge and then the metal arches of the Kennington rail bridge, photo 27, which carries the freight railway branch line that serves the BMW Mini factory at Cowley. Once under the rail bridge the path heads across a riverside meadow before joining a short tree lined section of path which leads to a bridge over a weir stream. 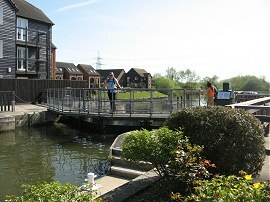 The Thames path is now running over a small wooden island and crosses more two more inlets to the weir stream before heading over a grassy area to reach Sandford Lock, photo 28. This lock has the deepest fall of all locks on the Thames at 8ft 9in, the difference in water height can just about be made out in photo 29. Despite putting plenty of the suncream on my right arm and neck were by now feeling very hot from the sun as wherever we were walking the sun always seemed to be on our right so we crossed over the lock gates to find a bench that offered a bit of shade while we stopped for our lunch break. Having eaten, we headed back over the lock gates and rejoined that path which crosses over the exit channel of the weir stream and heads up to a small car park at the end of Sandford Lane. 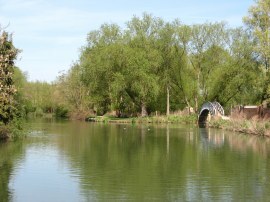 The path then heads along the tree lined banks of the river with a fence separating the path from the fields on the right before running along the edge of a large open field which curves gently round to the boathouse of Radley College where we finsihed this stage of our walk along the Thames Path, photo 30. We then headed up a track on the right, which is also part of the Oxford Greenbelt Way which lead up to our parking spot in Lower Radley. Reaching the car we had walked a total distance of 12.6 miles of which 12.2 had been along the Thames Path. Despite this being a relatively short walk Swinford bridge seemed a long way away and the landscape we were walking through had noticeably changed from the very rural start of the path. All in all this had been another good weekend walking, we have made good progress along the path and had been spoilt by the excellent weather. 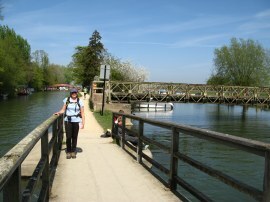 As usual I have uploaded the route of the walk which can be accessed here: Thames Path Stage 5 Route.